Glasgow is the largest city in Scotland, with the centre retaining an interesting variation of 1800s and 1900s architecture. The city grew dramatically in size and wealth from the 1700s through trade with British North America, and the British West Indies, especially with tobacco and sugar. 50 Large Glasgow Photos. 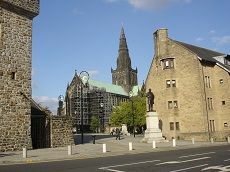 Glasgow has a large number of interesting attractions, such as museums and historic buildings. The centre of Glasgow is George Square, where you can catch the City Sight Seeing Buses. Tour Buses are the best way to visit most of the Glasgow Attractions, as many of the top attractions are well spread out across the city. Glasgow Attractions Click On Map. Shopping in Glasgow is by far the largest and most diverse in Scotland, and the city centre alone, has about 32 Hotels, 121 Restaurants, 69 Bar Diners, 10 Theatres, 9 Night Clubs & 6 Casinos. Around the city are 37 golf courses. Glasgow International Airport is situated 9 miles west of the city, with inexpensive bus and taxi rides into the city. Glasgow Prestwick Airport is situated 32 miles southwest of the city, this airport normally links with European airports operating budget airlines. Regular inexpensive buses and trains run between Prestwick Airport and Glasgow city centre. Glasgow is also a good base to explore Scotland, with regular inexpensive Buses and Trains running to Stirling 50 minutes travel time, Edinburgh 50 minutes, Inverness 4 hours, Ayr & Alloway for Scotland's most famous poet Robert Burns 50 minutes. The scenic Loch Lomond is situated about 25 miles northwest of Glasgow. There are regular Buses to Loch Lomond and many Boat Tours along the loch. For north of Glasgow Area Attractions and Activities, view the north Click on Map. For south of Glasgow Area Attractions and Activities, view the south Click on Map.